I see that Instapundit has become aware of Parkinson’s Other Law, the one about custom-built headquarters buildings. This is the law that says that any organisation which builds itself a brand new headquarters building is heading for disaster. Pity. I really like Amazon. I hope its death throes are prolonged enough not to derange me too much. I hope, that is to say, that in the near future, it is Amazon’s shareholders who suffer most of whatever Amazonian grief is about to erupt. However, I do fear that if, as a result of a share price collapse, Amazon then tries to be profitable, this might hurt us now-very-happy customers quite badly too. 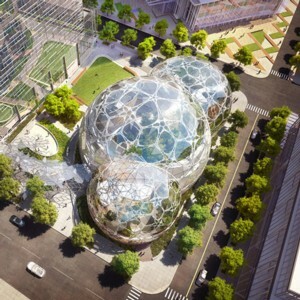 Immediately after the Dezeen piece linked to above, about the new Amazon HQ, there came another piece, about a new Twitter HQ. But, although suspiciously well designed (hence it being noticed by Dezeen), this is to be in an already existing building that used to be a furniture store. This is the right way to contrive a new headquarters building, if you really must have such a thing at all. Investors? I didn’t invest in Amazon. Who knows what on-line merchant will eventually come out on top? I invested in delivery companies. Whoever sells it, somebody has to deliver it — and there are a lot fewer of those. While I think this law is true in many cases — mostly stodgy old businesses looking for a new image — I don’t think it’s true of Silicon Valley companies. They have always been building on literally green fields. Almost all of the buildings that Apple is in were built for Apple. Their last fancy architecture new headquarters building was opened in the mid 90s I think, a few years before their big boom. The same is true of Microsoft (in Redmond of course). Oracle’s headquarters by the bay is famous. Google builds their own buildings. The problem for Apple now is that they have acquired small parcels of land piecemeal over the years. They have buildings scattered all over the place. Their new building is mostly to get everyone together onto one site. If you need to have a lot of people, you don’t want most of them to be buried inside far from windows, and you’re not allowed to go upwards, then a ring with open interior space has been the favored solution many times in the past. The perceived need for big, custom HQ buildings in the tech world suggests that it isn’t only Marissa Meyer who isn’t entirely happy about tech company staff telecommuting. There’s nothing wrong with buying other organisations’ facilities to use as a new HQ, of course; and if you’re a company which is seriously into security, you’d have fun trying to do better than the folk at thebunker.net . (Most of the old UK Cold War command centres were sold off about a decade ago, and unfortunately RAF Skendleby was just too far from anywhere to be practical for me…). Incidentally, Ellen, commenting above: that’s a very shrewd investment call :-). Sorry to be a pedant, but that’s death throes. Sorry. Amazon is doomed, right enough. It is running on wafer thin margins and dependent on tax privileges that are in the process of being revoked. The other day, I bought a couple of HDMI cables, delivery free (I can wait), they sent the wrong ones. So I contacted the returns department, they were extremely helpful but didn’t want the cables returned as the cost and admin overhead was too much – they did refund me though. Excellent customer service, but not a very good business model. Dave (above) — you stole my thunder…………..there is something ironic about Twitter (of all companies) needing a bricks-and-mortar HQ. I don’t know if the (second) Parkinson’s Law is universally true, but it definitely applies to banks. Find one with an opulent new headquarters (and especially one with an opulent board room) and you have a fine short sale candidate. Amazon will carry on till home printers (and BINDERS) become inexpensive. Then people who prefer physical books (such as myself) will just produce them ourselves (having downloaded the text from the internet – remember people like me are mainly interested in books that are past copyright, and other people do not care about copyright) rather than buying them from Amazon. Till then Amazon will continue. I was in a rage with the owner over his bailout of the Washington Post. But at least (unlike that Bill Gates person) Jeff B. is against high taxes. And not just high taxes on Amazon – high taxes on anyone. Why were you in rage? And Amazon is long past just selling books – I buy almost everything there. I am always in a rage ALisa – like Daffy Duck. And Amazon does indeed sell many things. I think it now costs at least 10¢/page to print an average amount of ink onto an 8.5″x11″ piece of paper, so a 300-page book that I can get used from Amazon for, say, $ 8 (4 for the book + 3.99 for the shipping) would cost $ 30 to download and print at home. Also, what good is life without a fabulously well-stocked used-book store. Here’a another reason to avoid Amazon and others offering remote delivery.